As some of you may know, I recently merged 4 Blogger blogs into one blog. It has been wonderful since doing that because it is easier to focus my energy and resources in one spot rather than divide it. It was not as difficult as you may think but it did take a bit of time. I thought there might be others who need to merge multiple blogs into 1 so I thought I would share how I did it. First, I went to each of my old blogs. In the upper right side of the screen in the blogger toolbar I clicked on "design", this should take you to the template page (you can also access the same page from your list of blogs page by clicking on template). Next, click on "settings" in the lower left side of your screen. This will drop down more options. Click on "Other" . Now at the top of this page in blue letters you will see import, export, and delete. You want to click "export". This will download a file of your blog posts to your computer (don't worry your blog will still be intact.) This is a good practice to do at least once a week or month because you have now just made a back up of your blog posts. You can keep this file on a memory stick or make a backup CD. This ensures that you can easily repair your blog posts if something (God forbid) happens and it gets deleted or messed up. I did this for each of my 4 blogs. To upload the posts to the new blog (or the old one if needed) you go to this same page and click on import. Then click "choose file". This is where you find the file of your old blog and click on it and then click "Open". Now type in the two words in the Captcha to prove you are not a robot (I hate these but they are necessary for this). You can check "automatically publish all imported posts". Next click the orange "import blog" button." This will upload all your old posts. I did not check the "automatically publish all imported posts" so it filed all my posts in the archives. If you go to view your blog and cannot find your posts then you should find them filed under the imported files or drafts) To fix this (from your blog view) you will need to click on "design" in the Blogger toolbar. To the right of your blog name you will see a little icon of some papers. Click on that icon. This will take you to your post list. You will then need to manually post every post that you want seen by visitors to your blog. The archived posts can be found under imported or in the draft file if they are not posted. To post them open each one and click publish. They will publish to their original date unless you change that. I left mine the same. It is a good idea to check all your links within your posts to make sure they are updated to your new blog if you are creating a new blog. That is why I had to manually publish all my old posts to my new blog. It took a lot of time but it allowed me to make updates and to leave out the posts I didn't want to add back onto my new blog. You now know how to backup your blog posts but you can also backup the blog design. This is also a good idea to do every time you make any changes to the design. To do this you need to go to your blog. Click on "design" in the upper right side of the blogger toolbar. This will take you to the template page on your blogger dashboard. In the upper right corner of the screen you will see "backup/restore". Click "Backup" then click on the orange button that says "Download Full Template". This will download a file of the full template for your blog. When you want to upload the template then you go to the same template page and click the same button then instead of pushing the download button you will browse your computer for the file by clicking "choose file". and then click "Upload". Voila! One more quick tip before I go...it is a really good idea to create a second blog that is private for only you to see. This blog can then be your test blog. A place to practice and try out new things before you add them onto your actual blog. That allows you to perfect it first and make sure it works right. This will save you hours of frustration and possibly even the loss of your blog. P.S. 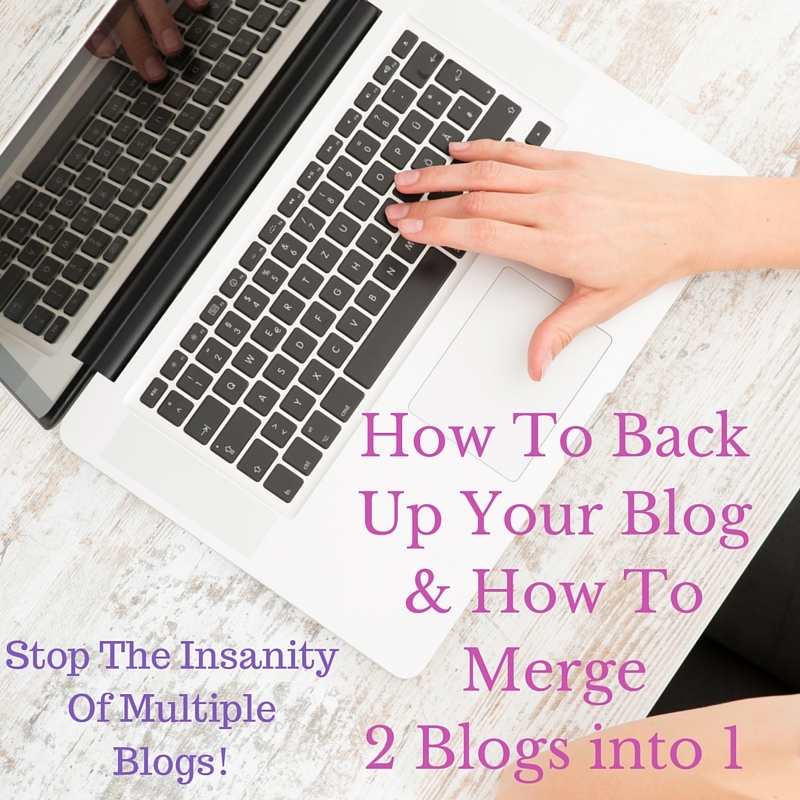 In answer to a question about whether all your followers will migrate too when you merge more than one blog: Unfortunately, if you merge two or more blogs then your followers will not be migrated too. If you use one of the old blog addresses then you will still have the followers of that blog. Because I merged all mine to a completely new blog address that meant that I had to start completely over with followers. I new that going in and decided it was worth it for me to direct my energy in one place rather than 3 or 4. Please feel free to ask me any questions about merging that you may have. I would suggest that you prepare your followers and give them time to change over to the new blog address before closing down your older blog address. You are amazing! Thank you so much for all you have done!!! : ) I love love love that you posted this in such a timely manner ~ YOU ROCK!!! When you import your old blogs, does it maintain all the dates and comments? i had a friend forward this to me! so surprised that i completed a technical task and it did not fail! great tutorial ~ thank you. Great tutorial! When you merge, does the followers merge too? Unfortunately not unless you keep one of the original blogs then you will only have the followers from that blog. Thanks for stopping by my blog. Thank you so much! It helps to have feedback and I so appreciate you stopping by my blog. Thank you so much for your wonderful advice Debra. I will be putting it to good use to get my blogging house back into order and hopefully back online with a clear purpose! OMG!! THANK-YOU!!!!! Whew. I can eliminate my multiple personalities. Painlessly merged into ONE! Hi - thank you for the detailed tutorial! When you merge blogs, do comments from old blogs also get migrated? Or do you lose them? Yes, your comments are migrated with your blogs. Thank you Karrlin, I think you rock too girl! Yes, it does maintain all the dates and comments...understand that all the links will be changed so if someone has an old link such as on Pinterest then it will no longer be good so you will need to re promote those posts but the good news is that you get to re promote those posts and you get a chance to spiff them up if needed. Thank you Tanya, I hope the merge went smooth for you. Blessings on your new updated and bigger blog! I hope it goes great for you Di, thanks for stopping by and I will be watching for your blog. I am so glad Sabrina! Doesn't it feel so much better! I have not had any regrets...although it has taken some work to get my followers back up but they are rising daily. I hope your new blog prospers! Thanks! I ran into an error that said you have exceeded the max number if imports. Please try later. Wow! I am so sorry, I was not aware that there was a limit on number of imports. I imported 4 blogs without any problems. I wonder if you wait a while it will let you import some more later. However, does the merging of blogs support keeping each blog as different pages on blogspot? Actually that is not how it works when doing this method...as you upload the posts from the multiple blogs then it combines them as if they were all from the same blog and they will be sorted in order by date. Thanks for the tutorial, Debra. One question, will people be able to find the new blog when they do a keyword search for something on the old blog? Thanks. You can add the keywords onto your blog. It would take some time but you could go back into the posts, click on the photos, click on properties and add the keywords onto the properties. You can also do a custom redirect as I describe in the post above, you can also make sure that you write about or mention the old blogs and add the old blog names as a label. All these things would eventually add up to your new blog coming up near the top when those keywords are typed in. So helpful - thank you! Wow... Your amazing!!! Something so complicated you have put down so simply...!!! Thank you!! Haven't done it yet... But can't wait to... And now i'm not scared to!! Ha ha!!! Your post was helpful. Thank you so much. I was able to merge my two blogs. Now it will be much easier to maintain one account. Your directions were so clear, and this made it so easy. Thank you! Between the two post, I have over a thousand views and was wondering if I can merge the view as well. Any advice would be greatly appreciated. I truly learned something new here thank you!! Great information. I have been trying to work out if this could be done for ages. If only I had found you months ago. Thanks for your guidance on blog combining Debra. It got me to take action. I'm wondering if anybody else had difficulty with the importing. The process is clear, but the little circle just kept whirring around without downloading/importing one blog into the other. Thank you. I just did it! Perfect. Further question. Sorry if you have already answered it and I haven't noticed - is it possible to import another blog into the page of the new blog. For example I have a page which is simply a picture with a link to our online store site which is just another blog. Could I instead have that page be the actual store site allowing of course for the same template design as the new blog but the posts would be about the store and products. Hope this isn't too confusing a question. Tks so much. I was thinking to merge my 3 blogs into 1, too. I'm so glad I stumble upon this article. Thanks s much! Great post and thanks for the additional tip on "test blogs"
thanks very much for this post. always wanted to merge mine together. and it was a breeze with ur post. Hi, do you have an article about how to put google adsense ads on blogs? I have 2 google accts under different email addresses and have had a horrible time trying to put ads on them. Google doesn't really have anything like customer support. I do not currently have an article on how to put google ads on a blog but I would be glad to write one. I will get to work on it as soon as I can. Hi Debs thank you for sharing this information. That is so wondwrful of you. I have several blogs too and what i did is to add them on pages in a blog so one can click to my other blogs and then i will try vise versa. That is a great idea Gert! I considered doing it that way but in the end decided I wanted to use my .com name and felt that was a great time to make the change.